There were some top Super Bowl contenders that lost in Week 1. Pittsburgh in New England, Seattle in St. Louis, and Baltimore in Denver come to mind. But those games were all competitive. So I think it's fair to say that no potential Super Bowl team looked worse last week than the Indianapolis Colts. Thus, I'd also say that makes Monday night's home opener against the Jets a must-win because we all know how hard it is for 0-2 teams to make the playoffs. And believe it or not, winning or losing the opener is pretty important as well. Since 1978 when the NFL went to the 16-game schedule (and excluding the strike-shortened season of 1982), of the 538 teams that won openers, 281 would reach the playoffs and 168 won division titles. Of the 539 that lost openers (numbers aren't equal due to league having 31 teams for a few years), 129 made the postseason and only 74 won their divisions. I don't think it was a shock that the Jets beat the visiting Browns in Week 1, but it was a through a**-kicking in the New York head coaching debut of Todd Bowles. Jets QB Ryan Fitzpatrick, who is only starting because Geno Smith got sucker-punched in training camp, was solid enough in going 15-for-24 for 179 yards, two TDs and one pick. That's about what Fitzpatrick is. Chris Ivory rushed 20 times for 91 yards and two scores. And new Jet Brandon Marshall caught six passes for 62 yards and a TD. The Jets defense, which will be crazy aggressive under the blitz-happy Bowles, forced five turnovers and had three sacks. In 2014, the Jets had 20 points off turnovers all season long. 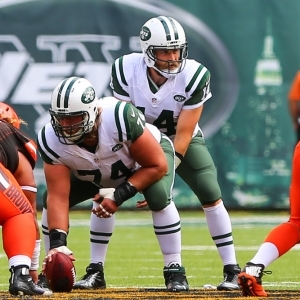 Last week against the Browns, the Jets had 21 points off turnovers. The New York D did suffer two injuries in the game: linebacker Lorenzo Mauldin and cornerback Antonio Cromartie. The former suffered a concussion and the latter a sprained knee, which made the Jets thrilled because they worried it was torn ligaments. Both seem doubtful for this game. Marcus Williams, a second-year cornerback from North Dakota State, will most likely replace Cromartie, who was brought back in free agency this offseason along with Darrelle Revis. As for the Colts, they looked overmatched in a 27-14 loss at Buffalo that wasn't that close. The Colts turned the ball over three times, had only 64 yards rushing with new No. 1 tailback Frank Gore and allowed offensively-challenged Buffalo to put up 342 yards. Andrew Luck had a rating of only 63.6, completing 26-for-49 for 243 yards, two scores and two picks. He was 10-for-25 with two interceptions against blitzes. Luck was blitzed on 49 percent of his dropbacks. Expect plenty more! Gore had eight carries for 31 yards. Andre Johnson, another new addition, had four catches for 24 yards. Indy star receiver T.Y. Hilton suffered a bruised right knee in the loss and is questionable for Monday. Donte Moncrief would start if he can't go. Also monitor the status of top Colts pass-rusher Robert Mathis. He missed all of last season due to suspension/torn Achilles' tendon. Mathis, who had a league-best 19.5 sacks in 2013, was hoping to get back for the opener but was inactive. There's already some drama surround the Colts. Rumors are that GM Ryan Grigson and Coach Chuck Pagano haven't been on the same page for a while. Pagano might be in a lame-duck year. He reportedly turned down a contract extension last offseason because it was a low-ball offer. Nothing to take from last meeting between teams, a 35-9 Jets home win in 2012. At 5Dimes , the Colts are 7.5-point favorites (+110) with the total at 47. Indy is -330 on the moneyline and New York +270. On the alternate lines, the Colts are -7 (-110) and -6.5 (-130). The Jets are 5-0 against the spread in their past five vs. the AFC. They are 3-1-2 ATS in their past six following a win. Indy is 18-3 ATS in its past 21 following a loss. The Colts are 21-6-1 ATS in their past 28 at home. The "over/under" has gone under in six of Jets' past eight vs. AFC. The over is 14-3 in New York's past 17 after scoring 30 or more points in its previous game. The under is 7-1 in the Colts' past eight. The under is 5-2 in their past seven at home. Oddly, this is Fitzpatrick's fourth straight season starting vs. the Colts but with a fourth different team. He was with Buffalo in 2012, Tennessee in 2013 and Houston last year. All Bowles wants him to do is manage the game like in Week 1 and avoid mistakes. The Jets are still the same: win with running and defense. New York jumped to +4000 to win the AFC with its Week 1 victory. That Colts offensive line is a problem. And both Gore and Johnson look old. But maybe that was just Buffalo and on the road. Offenses generally play better at home without having to deal with the noise. But that Colts defense isn't anything special, either. But let's not overreact yet. Indy, which is still the +485 second-favorite to New England for the AFC title, will play with some desperation here. To be safe, use the 6.5-point line and give the points. Go under the total. Doc's Sports has been successfully handicapping the NFL for years - more than four decades in the business - and wants to give new clients a chance to try our service for free. Click here for the hassle-free sign up and get $60 in free NFL picks today . Also, get three handicappers for the price of one when you sign up for a full-season football package! Click Here for details.